Don't wanna drive? Let us drive you! Locals rejoice: Bus tour, minus the bus! Buckle up time travelers, we're trekking back to 18th century Scotland! We've joined forces with Lorna's Laces to bring you this month's Lorna's Limited Edition color - "Voyager." This colorway incorporates an array of grassy greens with speckles of soft purple, reminding us of the vast Scottish Highlands sprinkled with pretty wildflowers! 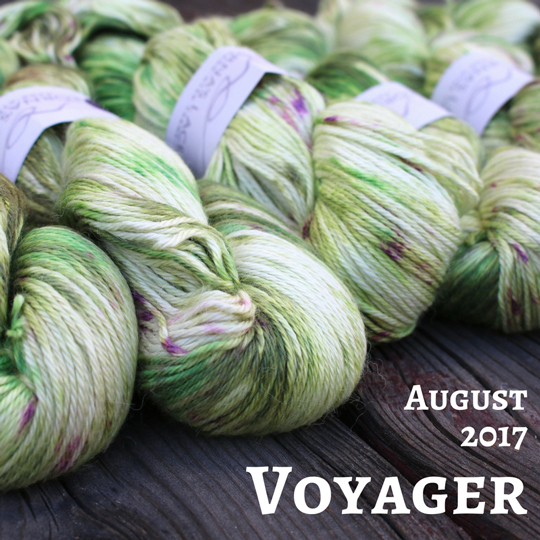 Once again, Rachel Roden of Unraveled Designs will be kicking off the new season with another MKAL, this time called "Voyager!" Available for purchase through her Ravelry page, Rachel's pattern will use one skein of Shepherd Sock, along with a coordinating String Quintet Pack. 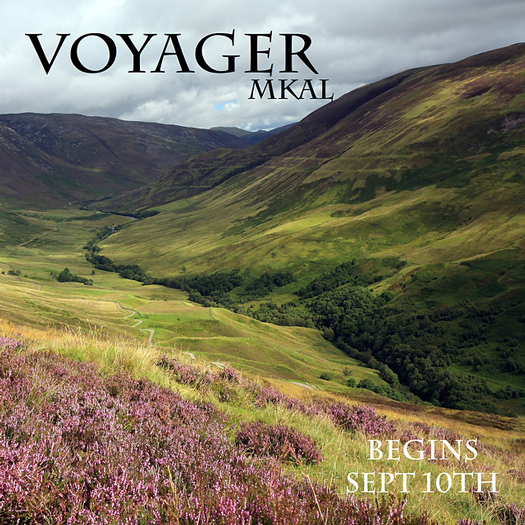 We've even created special Voyager MKAL Kits so you can easily obtain all the yarn required to cast on with us September 10th! 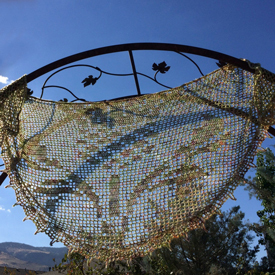 Monika Evans (of merryClusters fame) designed a lightweight crochet shawl which Claire or other travelers might like to wear on a breezy evening on deck, even in warmer climates like Jamaica. The design, crocheted with two skeins of Shepherd Sock, is based on an image of a Scottish Thistle to remind them of home, even while their adventures take them halfway around the globe. 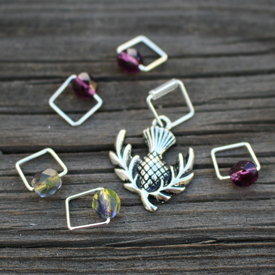 And finally, Leticia from Spark Stitch Markers also used the Scottish Thistle as inspiration to create limited edition stitch markers that coordinate perfectly with the yarn and MKAL! It has been Jimmy's undying (undying... get it? Like un-dye-ing?!) dream to bring fiber enthusiasts from all over to the Biggest Little City for a fun-filled day of knitting, games, prizes, how-to workshops, and of course, shopping! At long last, that dream has finally become a reality with "Jimmy's Biggest Little Bus Tours" Our first monthly bus tour will depart from and return to the Bay Area (with a stop in Sacramento) on Saturday, August 5th. We'll supply plenty of games and activities as we venture to Reno, and the hosts of the podcast 2 Knit Lit Chicks, Barb and Tracie, will even be hopping on board! 22,000 sq. feet of Yarn-topia with an all-access tour of our retail store and warehouse. Meet & Greet with owner Jimmy (a.k.a. Laura) and local knitting celebrity Romi Hill. A delicious catered lunch on-site, and a hearty snack for the ride home. And finally, a hand-dyeing yarn class taught by our in-house designer, Rachel Roden. Our August 5th date filled up fast, but if you're eager to hop on the Biggest Little Bus, you're in luck - our Newsletter readers have FIRST dibs on our upcoming September 9th and October 7th tour dates. Details for October are still being worked out, but we're certain the following two bus rides will be just as fun as the first! 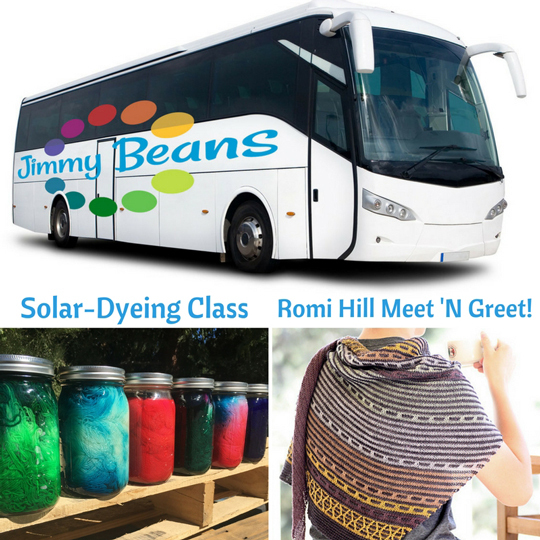 Locals who want to partake in the Bus Tour's activities, but understandably don't need to ride the bus, can instead sign up for the "Solar-Dyeing Class & Meet 'N Greet Only" option with Rachel and Romi on August 5th. 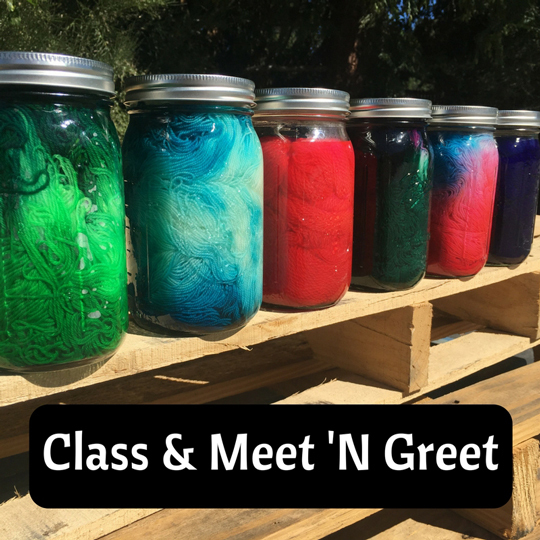 Participants should arrive by 2:30pm to mingle with Romi Hill, then begin the solar-dyeing class (using yarn graciously donated by Lorna's Laces!) with Rachel around 3pm. Can't attend, but want to participate? Purchase a hank of Mrs. Crosby Satchel in the color Creme Fraiche (or another undyed yarn) and join us on Facebook Live! 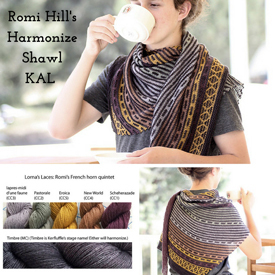 Romi will not only be here on Saturday to mingle, but also to promote her Harmonize Shawl Knit-Along, which kicked off on August 1st in the Knitmore Girls' Ravelry group. For those who haven't yet purchased a Harmonize Shawl Kit from Lorna's Laces, don't fret - there's still time to purchase one and enjoy the Ravelry buzz with everyone else who's participating!